At this year’s Women and Environment Symposium, speakers discussed environmental justice and related topics such as healthy homes and family health, inclusion and localizing food. 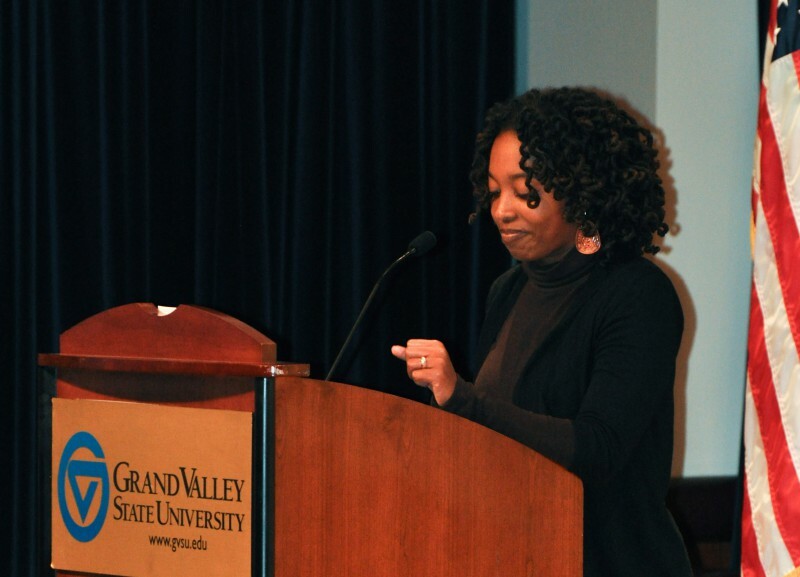 The Women and Environment Symposium hosted by the West Michigan Environmental Action Council (WMEAC) and Grand Valley State University aspires to educate, to inspire and to motivate participants to act. This year’s theme centered around environmental justice. Environmental justice, explained keynote speaker Nikki Silvestri, is ensuring that both the people and the planet are healthy as we build human societies. Silvestri was named one of The Root's 100 Most Influential African Americans in 2014 for her work as a thought leader in the environmental justice movement. Silvestri is the former executive director of the organizations Green For All and People’s Grocery. She has spoken at venues ranging from TEDxManhattan to the Melissa Harris-Perry show. Silvestri spoke about her personal story and how she became an advocate for environmental issues to demonstrate the complexities each person has. Her dad was a radical in the 70s and her mom was somewhat of an ‘eco-hippie’ who decided to raise and foster young black boys. She says growing up with foster brothers taught her not to label people and to still love them despite their complexities. “One of my teachers gave me the assignment to go to the library and look up the newsletters from the mainstream environmental organizations, and I did. All I saw was a sea of old white men and whales. But I didn’t see myself,” Silvestri says. Silvestri says the mainstream environmental movement still looks predominantly white and the people working for environmental justice part of the movement are viewed as the scary folks. Because race is a social construct, she says, black people have been designed to be the "ID" in the psyche of American culture. Silvestri also said when police officers were asked to describe African American men in a survey, the terms used were not fitting for humans, according to the analysis of a psychologist. “They didn’t relate to them as being real or being ‘us,’ it was very much a ‘them.’ This has real consequences. It means our complexities are lost and we’re just painted as monsters,” Silvestri says. In the National Climate Assessment report of 2014 under the indigenous peoples, lands and resources sector, stated the impacts on native people. These impacts include displacement due to the rise in sea level, the degradation of land, the loss of traditional knowledge in the face of rapidly changing ecological conditions, increased food insecurity due to reduced availability of traditional foods and changing water availability. This is one of the most pressing environmental justice issues right now, Silvestri says: that those of us who are living the most in harmony with the environment are the ones harmed the most. Environmental organizations have millions of dollars worth of assets in land that originally belonged to people of color, Silvestri says. Activists in the food movement that Silvestri worked with have said in order to fix the food system internationally there has to be an end to the violence against women, because women are the majority of food growers in the world. “I feel like people of color and women are incredibly impacted by environmental degradation and thus it’s important that we continue to get involved with the movement,” Silvestri says. It’s important to extend the hand of relationship before extending the action of doing, Silvestri says, and it’s only when relationship and action come together that you get real, lasting solutions that build trust instead of breaking it. Knowing what your role is in the environmental movement, resourcing yourself and expanding your capacity for uncomfortableness, says Silvestri, are necessary questions for those wanting to be involved. “It’s important to expand your landscape” Silvestri said, "by having humility in knowing you have only part of the story but also having dignity and confidence in your part of it."